Замена стандартной кроватки в Sims 4. Убрана нижняя часть, сама кровать. Теперь ребенка можно положить на любую поверхность, в том числе и декоративные кроватки, сделанные другими. Чтобы вернуть первоначальное состояние, просто удалите объект из игры. Так ребенок смотрится на разных поверхностях. 1. Поставить невидимый объект на любом пустом месте. 2-3. Дождаться, пока симка родит. 4. Теперь ребенка можно уложить в кроватку. 1. Put invisible object at some empty space. 2-3. Wait for the baby. 4. You can put baby into the crib now. Thanks! This mod is great! It has so many uses! My male sim was abducted and just had alien twins. I wanted to get a photo of them together, but it turns out they look like human babies when in this crib. Could you make one for the alien babies too please? can you explain how to install this correctly? I have been trying and trying but I can't seem to get it to show up in my game! urgh the many aggravations of using cc on sims!!! You just put both files in your Documents/Electronic Arts/ The Sims 4/Mods folder. Do you have both files? One is a deco crib and the other looks like a baby in the kids furniture section (that's the invisible crib). this doesnt work in my game help! Is this compatible with the latest patch? Its giving me the base bassinet but I cant put the baby in it n the invisible crib doesn't show help pls! One file contains the bassinet as a deco object only and the other is the actual invisible baby/bassinet object (looks like a baby in the catalog). Unfortunately the baby and bassinet are one object and can't be separated from each other. 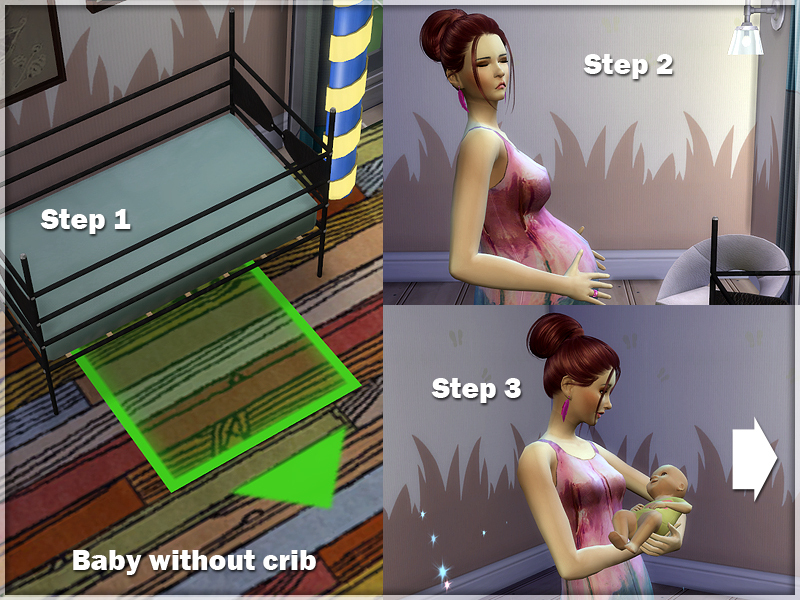 If the baby has already been born before you placed the invisible crib you can't remove it from the crib the game provides. Did you place the invisible crib before the baby was born? Do you have both files in your folder? Maybe you're missing the invisible replacement crib? Sorry, the email doesn't want to go through, failing. Is it the right address? Love this mod, but it won't work within my game. After downloading, when I right click it, there is no option to extract the files. When I launch my game, on the shop furni thing, there is no bassinet in the kids section, with a photo of the baby, just the bog standard one that comes with my game. Any help, thanks! So you can't extract the files? That's probably why it's not showing up. Doesn't look like the creator's been here for a while. Umm...can you give me an email or some place where I could send you the files separately maybe? Yeah sure, AmeliaChelseaPixels@gmail.com , thank you so much! Sorry for the late reply, I've been so busy, and my laptop broke. when i extract it only the default file shows up...any help? There should be two files. The default one and the crib as deco. Maybe try the other download link, or leave your email and I'll send you both? Does this work on a mac.......help????? What is the dress that she was wearing download link? won't show up in game. i have looked everywhere. can anybody reply and help me step by step in making sure I installed it right? thanks! You put both files in your Documents/Electronic Arts/ The Sims 4/Mods folder. Do you have both files? One is a deco crib and the other looks like a baby in the kids furniture section (that's the invisible crib). They "say" installed? You just put them in there right? Without doing anything else? yes I just put them in there.....you extract it right? I extracted it into the mods folder. I have a mod manager application that I used and both items are checked (meaning they should be in game) but when I go into game they don't show up on the list of cc and they aren't in the game. I even checked the resource.cfg file and they're both listed on it. I didn't put them in a folder at all....none of my mods are in subfolders....should they be? No, they don't need to be, mine are still showing up. Hmmm...give me your email quick and I'll send you the files I have, maybe yours are corrupt...unless there's another mod in your game affecting this one? I'm not able to move around/select/delete the bassinet after placing it. There's no infant currently in it. Is it supposed to do that? 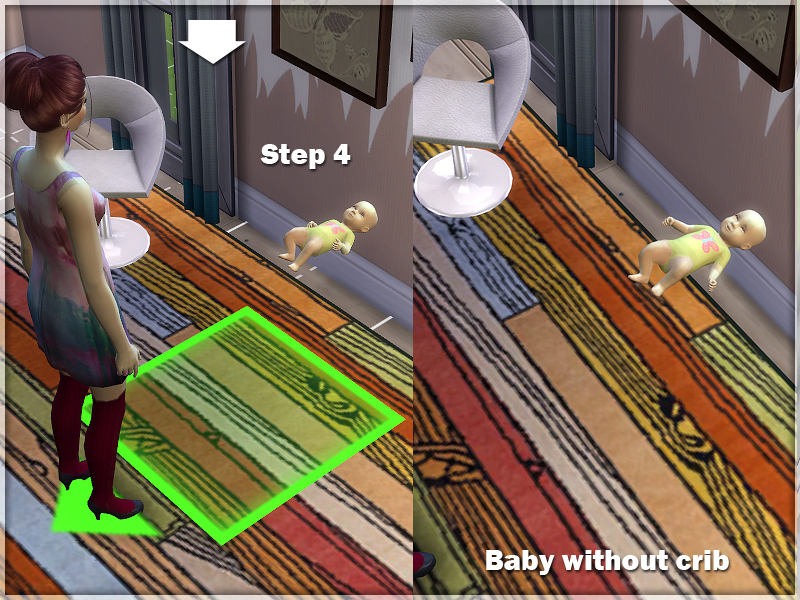 I'm trying to add cribs into pre-made houses that already have an invisible bassinet, but the cribs clip into the walls since the creator of the house placed the bassinet in a corner of the room. Oh yeah, I see what you mean. I can't move the invisible crib either. I think you can only move it when there's a baby in it, since the baby isn't invisible and selectable. 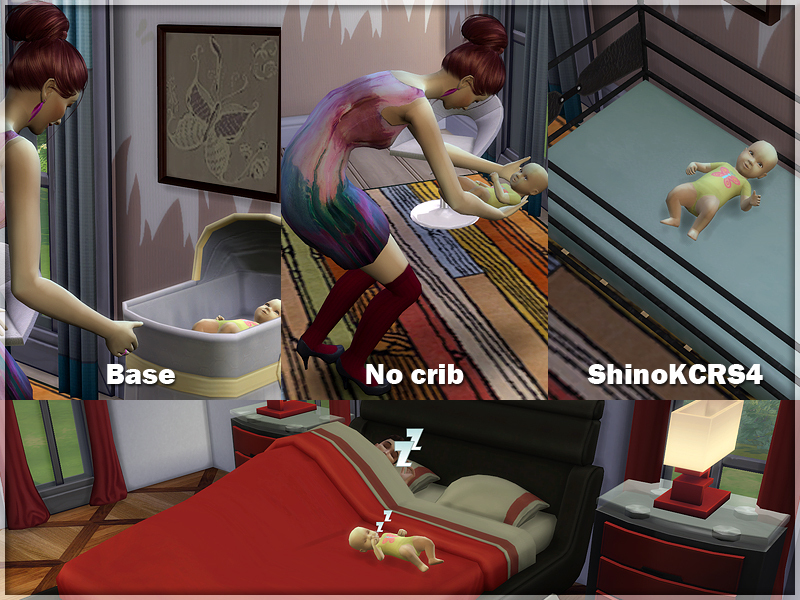 Do you have any babies using this crib in your game right now? If you don't, you can remove the mod, the invisible cribs will be replaced my the game ones again and you can remove them. Then you can put the mod back again if you want. 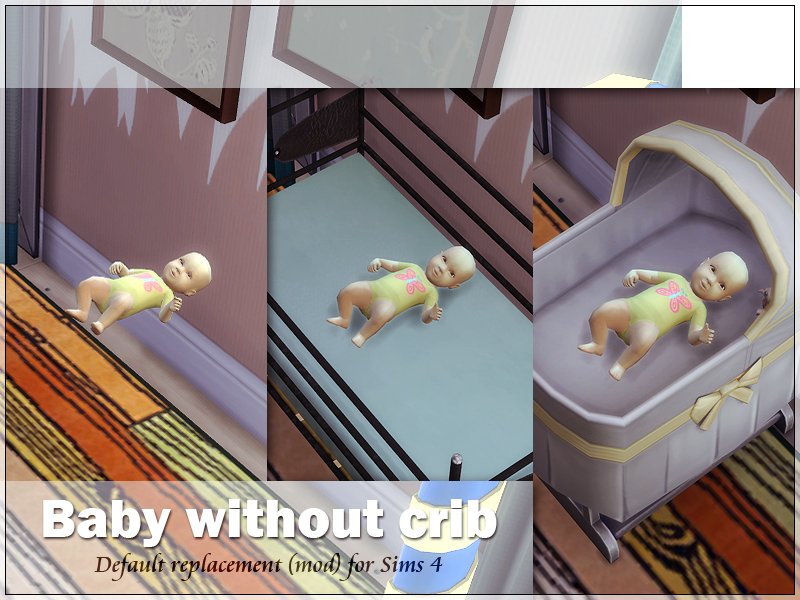 I'm not sure how this affects babies using the crib in your game though, not sure if they disappear or something. If you have invisible crib babies in your game show me where to find the house. Maybe I can delete the cribs for you and send it back to you. hey there DB! can you please send me both files! pxlarxid@gmail.com thank you! If your files aren't showing up in game you might have a conflict with another mod. Remove everything from your mods folder and try again with just these two files. If it works you can slowly put your other mods back and check again, usually the problem will be a mod that effects the crib or baby directly. If it still doesn't work your mods folder itself might be corrupt. Delete it and have the game create a new one by starting up the game. Just save your game first before you try these, maybe start a new "test" game too, just in case. I'll be away from my computer for about a month and a half so I've set up a dropbox with the two files for those that need them. (If you get that box that wants you to create an account, just click it away and you can click download again). Please let me know if it works, will be leaving on the 13th already.